I am in the midst of a refit/redesign of my Privilege cat. 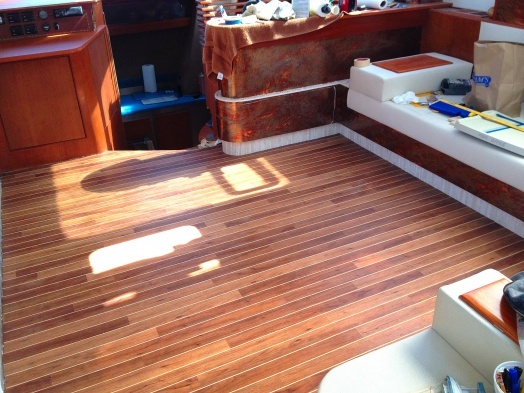 I decided to replace the cabin sole and wanted a faux 'holly and teak' flooring. I obtained quite a lot of samples from numerous manufacturers but I was not satisfied with most of them. Many of them looked just too fake; some of them were printed to resemble the pattern of holly and teak or they felt like a cheap kitchen linoleum flooring. I found this Amtico flooring to be just right. It's thin but looks very real. I've had it down for a year now with not the slightest scratch or mark on it, even just inside the entrance way. I used the CFL-W699 which is a 2 1/4" wide x 36" plank with 1/8" beach strip for the holly. We have a 2003 FP Belize, and the main cabin floor needs to be replaced/resurfaced. I'm told that it is a laminate - possibly vinyl with a poly finish. I can see from the bilge covers that the material is about 1/8" thick. - What was the surface you covered and how did you prepare the surface? - Did you remove the old laminate or install over it? Anyone else with experience using Lonseal over existing decking?